Whether it’s your 1,000th time traveling out of the country or your very first time going on an international adventure, there are always opportunities to make your trip even more relaxing and comfortable. I know that when I start planning a trip, the last thing that I want to worry about is packing – and how I’m going to fit everything that I need to make my trip that much more enjoyable. Read on to find out more about how best to prepare before heading out on a trip so that you can get the most out of your experience. It is possible to become severely hydrated on long airplane rides due to the lack of humidity in airplane cabins, so it is very important to drink plenty of fluids, namely water. You may even consider staying away from alcohol and caffeinated drinks, such as coffee. It also is important to realize that your skin suffers from dehydration, so make sure to pack a good moisturizer or lotion. Lastly, if you wear contacts or have very dry eyes, make sure to bring along eye drops or contact solution. Although going on a big trip is super exciting, do your best to try and get at least 8 hours of sleep the night before traveling. 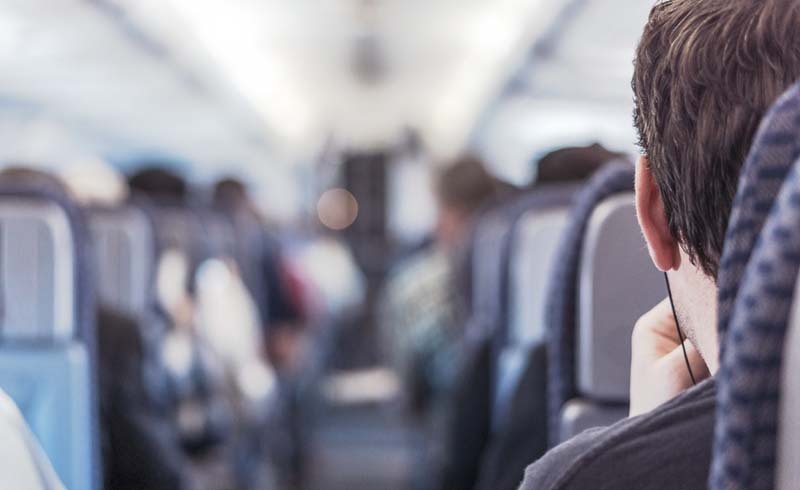 It is difficult to truly get a lot of rest when you are traveling for 10+ hours and you need to be alert when checking in, during layovers, and once you get to your destination. If you are on a red eye, you might consider taking melatonin to help you relax before heading off to sleep. To help you get comfy, I’d suggest using the Cat Nap Rest Set, complete with a soft sleep mask and earplugs to block out distractions, either on the plane or in noisy hostel/hotel rooms, as well as a travel pillow so you can keep your head nice and comfortable! It can be stressful to leave all your packing for the last minute, so I recommend starting a week or so before so that the day of, you can feel confident that you have everything you need, washed and ready to pack! I love to feel as organized as possible, especially when packing my smaller items, such as necklaces which always get tangled together. My favorite to use is the Pack-It Original™ Quilted Circlet Set, because the circlets are large enough to hold all my jewelry and the smaller zipper on the inside is perfect for keeping my items separated. As an added bonus, I also can fit belts and scarves into the larger size! I like having everything I need right at my fingertips, so I always try to use a carry-on. My carry-on of choice for an intercontinental trip is the EC Lync™ System International Carry-On because of how lightweight it is, plus it’s super versatile and durable. Although I hate to admit it, my carry-on is always stuffed full and usually feels like a bag of bricks, so starting with a super light bag makes me less fearful of crushing myself when I lift it overheard. This carry-on is internationally sized and yet still fits everything I need! Plus, it gives me the option of either rolling it or converting it into a backpack, if (god-forbid) I must run to catch my connection. Whenever I go on a trip out of the country, it’s always so difficult for me to choose exactly what I want to bring. The weather is almost always unpredictable, and there are always too many options to choose from in my wardrobe. Therefore, it is so convenient to pack up larger quantities of my clothing by compressing them down to take up less space using the Pack-it Specter™ Compression Cube Set. My favorite aspect of these cubes is that they are ultra-light, so I hardly add any weight to my bag AND they allow me to compress items so I can fit more. When I use Pack-It Cubes, it makes it easy to take out what I’m looking for quickly, and it creates a nice layer between my clothes and the hotel drawers. I don’t think I know anyone who has come back with less than they left with. And why would you? Everyone likes souvenirs or to pick up gifts for family and friends after visiting a cool place. Because of this, pick up an Eagle Creek Packable Daypack, which is useful as a lightweight bag for daytrips, but also a handy place to store your extras on your way home. One of the most important tips I can give is to be aware of your surroundings, especially when going to a foreign country that you’ve never been to before. While I personally love to wander, and discover new shops, café’s, and parks, it is still very important to always be aware. To keep my belongings safe, I use a money belt that fits securely around my waist, safe and out of sight from pick pockets. It also keeps all my important travel information, personal ID’s and debit/credit cards protected while going through security with RFID technology. Lastly, make sure that you have your phone with you always so that you can contact someone, or check Google maps if you were to get completely lost, or if you find yourself in a compromising situation. One of my favorite aspects of traveling is meeting new people and making friends. There is so much to learn and discover through someone else’s perspective. But, also be careful when giving out specific information about who you are, where you are staying, or what your plans are. In general, just use good reasoning skills to feel out the situation. Be safe, but also make bold choices and have a lot of fun while you are traveling. Immerse yourself. Experiencing a new culture means new foods, new music, and new people. Try things you wouldn’t normally do, don’t shy away from opportunities because you are too scared or nervous – besides, those make for the best stories later when you get home. Embrace everything that you see, hear, smell, taste, and touch, and don’t be too quick to judge. Traveling is a great opportunity to learn more about our world, to push yourself to try something new, and come home with an open mind and newfound respect for other cultures – so be yourself, be respectful, and be curious. In the end, no matter if you’re going on a backpacking trip in the Himalayas, skiing in the Swiss Alps, or adventuring to the beautiful beaches of Thailand, your trip will be so much less stressful knowing how to best prepare ahead of time.